As a new paper about integrating rapid re-housing and employment from my team at Heartland Alliance’s National Initiatives on Poverty & Economic Opportunity makes clear, far too many families in the United States are experiencing or at risk of homelessness for economic reasons. On a single night in January 2016, about 194,716 people in families with children were homeless. Over 1.2 million students nationwide were identified as experiencing homelessness at some point during the 2014-2015 school year, a figure that includes students who were living doubled up, in a motel, or in temporary housing for reasons including their family’s economic hardship. Alongside lack of affordable housing, insufficient earned income and unemployment are among the key causes of family homelessness. Currently, 42% of workers make less than $15 per hour and 28% earn poverty-level wages. One in three households has no savings account. There’s no place in the country where a full-time worker earning the federal minimum wage can afford a one bedroom apartment, and most renting families living in poverty spend at least half of their income on housing. Millions of families experience housing insecurity and teeter on the brink of homelessness, one financial challenge away from losing housing. In recent years, rapid re-housing has become a key national strategy to end family homelessness. In writing our paper, we dug into rapid re-housing research and interviewed over a dozen rapid re-housing providers across the country. We found that rapid re-housing faces a significant tension: although rapid re-housing participants generally must pay market rate rent following the end of a short-term rental subsidy, they often face significant barriers to employment and have experienced chronic unemployment, which can make it difficult to maintain housing after their rental subsidy ends. While rapid re-housing shows great promise in helping people quickly exit shelter into their own housing, the strategy as currently implemented falls short on helping participants meet their employment needs and achieve longer-term housing security—both of which are necessary to end family homelessness. 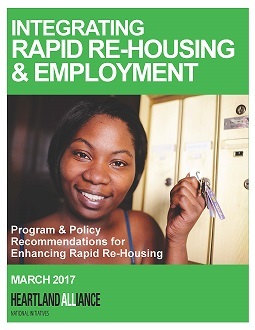 It’s vital to enhance rapid re-housing implementation and policy to ensure that all participants have access to employment, training, and supportive services that can help them succeed in quality jobs and stabilize in housing. Doing so requires that diverse stakeholders work together to share capacity, knowledge, and resources and to advance public policy solutions. These stakeholders include rapid re-housing providers, Continuums of Care, government officials, policymakers, advocates, philanthropy, and researchers. Cross-system coordination, collaboration, and leveraging of existing resources will be necessary to achieve our program and policy recommendations—all of which are informed by research and rapid re-housing practitioners’ insights. Offer financial capability services so that participants can manage earned income and start to build assets. Address the elephants in the room: lack of affordable housing and low job quality. Now is a critical time to ensure that clear pathways to quality employment and economic opportunity are a central component of programs and policies aimed at preventing and ending family homelessness—including rapid re-housing. Failure to do so will have negative impacts on families, communities, and systems. By making sure that rapid re-housing interventions are supported by the capacity, resources, and incentives necessary to provide pathways to employment and economic opportunity, we can make big strides toward ending family homelessness. Caitlin C. Schnur is the Policy Associate for Heartland Alliance’s National Initiatives on Poverty & Economic Opportunity, where she works to ensure that workforce development policies and programs account for the needs and interests of people facing barriers to employment, including homeless jobseekers.